Daily Illuminator: New Weightless Hardcovers?! August 8, 2017: New Weightless Hardcovers?! The impossible has become commonplace. Thanks to the digital sorcery of Warehouse 23, two of our recent hardcovers are now available as downloadable PDFs – rendering them without weight or even physical substance! The Discworld Roleplaying Game is a complete roleplaying experience, bringing Sir Terry Pratchett's incredible Discworld setting to your gaming table. 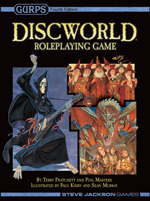 At over 400 pages of gaming goodness, the Discworld Roleplaying Game is the largest single hardcover we've ever done . . . and now this flat world – brimming with adventure and antics – is ready to be stuffed into your tablet or added to your digital library of GURPS Fourth Edition-compatible supplements. Or perhaps your imagination is leading you to defend the Earth . . . or conquer it! 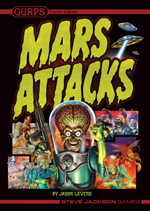 GURPS Mars Attacks brings the backdrop of the Mars Attacks trading cards from Topps to life, with history, secrets, GURPS templates, tech, and campaign insight that let you fight for humanity . . . or the Martians! Pick up either of these great PDF editions today . . . only from Warehouse 23!